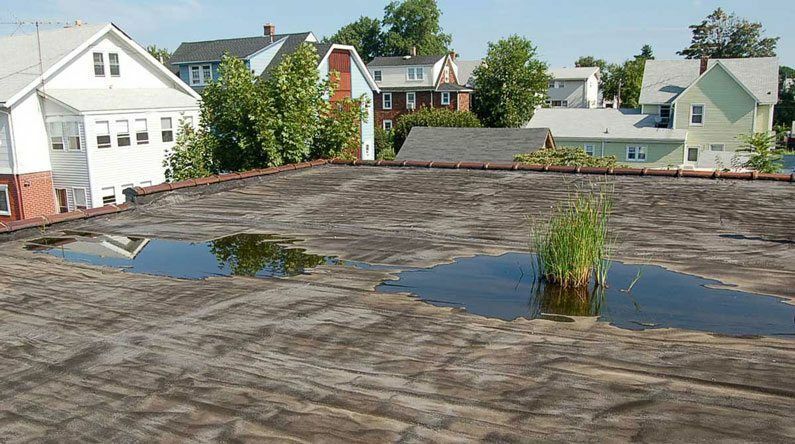 Rubber roofs were introduced in the late ’60s in the United States. Both EPDM and Modified Bitumen Torch Down Rubber membranes were making their way into the roofing industry early on. These rubber roofs have evolved since their conception. 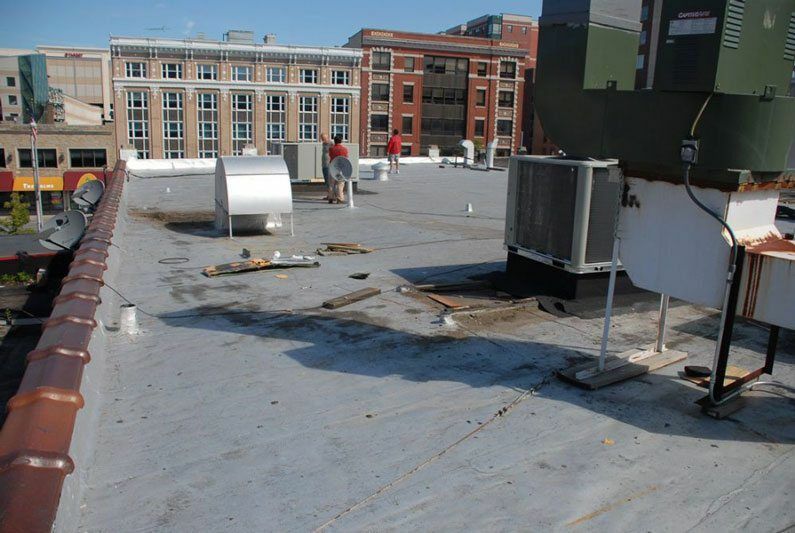 See the steps to take on Flat Roof Repairs for a Torch Down Rubber membrane. Most Modified Bitumen Torch Down Rubber membrane roofs can be repaired if it was protected against ultraviolet rays. EPDM Rubber Roofs have had its share of troubles. The biggest issue with an EPDM Roofing system is not the rubber membrane itself, but rather the adhesives used to bond seams together. A contact glue or cement was used for seaming and patches, but the extreme heat on a black EPDM roof quickly degraded or broke down the adhesion of the glue compromising the roof. Over the 40 years, EPDM manufacturers have introduced new formulations and fixes for this problem to no avail. In 2015 a new adhesive or technique was introduced, but we have already seen some roof failures. It is safe to say that so far there is no cure for this problem in the near future. EPDM Rubber Roofs also have a problem with ultraviolet rays. The rubber tends to get dry and shrink. In some cases, we have seen where the rubber has completely deteriorated. We still come across Torch Down Rubber roofs that were installed 30 years ago and longer that doesn’t show any sign of deterioration. We contribute this to the fact that the rubber membrane was protected against ultraviolet rays with silver or aluminum asphalt coating. Also, it appears that the roofing technicians knew how to weld the seams properly 30 years ago compared to today’s roof technicians. Torch Down Rubber roofs will outlast any other roof system by 30 years and more if installed correctly. Due to marketing tactics, EPDM roofs became more popular than Torch Down roofs. It is harder to find roofing contractors that know how to install Torch Down Roofs. This type of roofing system is what we recommend for any flat roof. 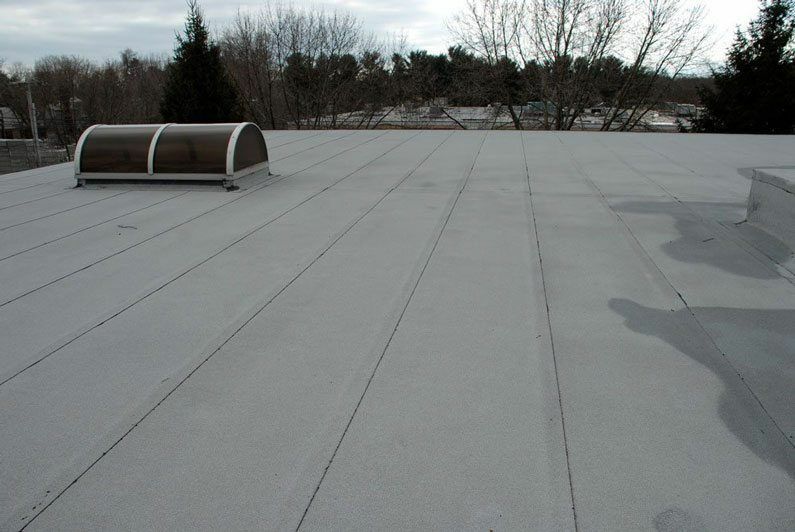 If installed correctly this rubber roof will last 40 years and beyond with little maintenance. We have been in the roofing business for 25 years and the roofs we installed 20 years ago are still holding up and some appear if they were installed yesterday. There is no telling how long they will last. Notice in the image how the ultraviolet rays have degraded the EPDM Rubber membrane. 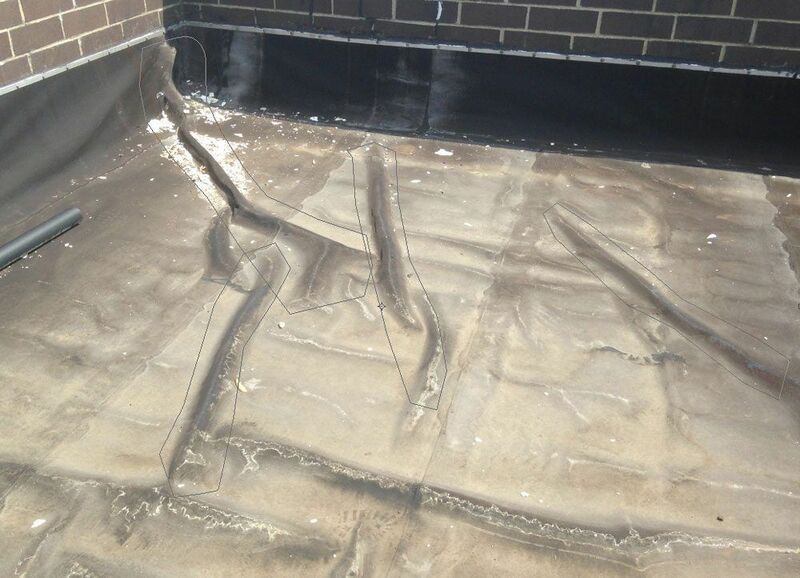 This EPDM rubber roof was only installed 12 years before the picture taken. Most of the EPDM Rubber Membrane issues are at the seams. The adhesives “cover tape” used for bonding seams together do not last in the extreme heat generated on a roof due to the black membrane. The temperatures will rise to 160 degrees Fahrenheit during a summer day, and that glue will lose its bonding properties. We installed this rubber roof over 20 years ago, and we had never been called back for any leaks or repairs. Notice that the roof has a white appearance. That is the ceramic granules embedded in it that have protected against ultraviolet rays. Without the UV protection, this roof would have only lasted between 12 – 15 years maximum. It is of utmost importance to protect any rubber roof from ultraviolet exposure. 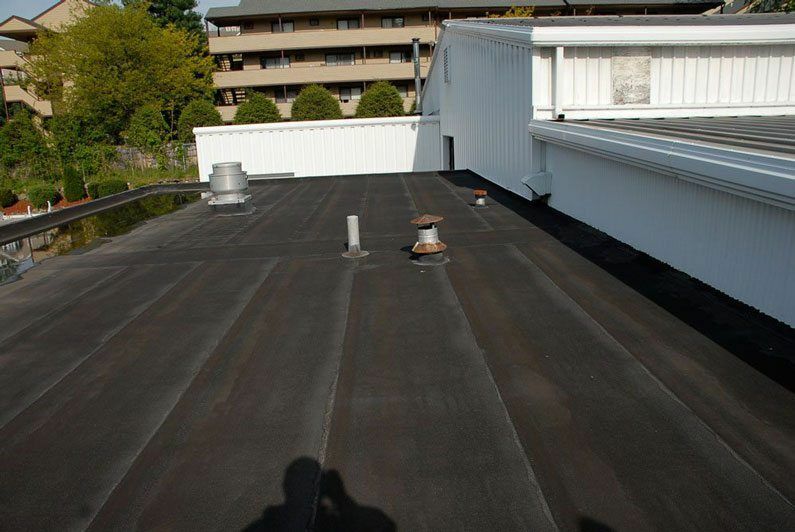 When Torch Down Rubber Roofs came on the market, they did not manufacture it with the ceramic granules for protection, so an aluminum asphalt paint was required to give it the protection. A silver coating was needed every 3 – 5 years. This image is a torch down rubber roof that was installed over 30 years ago. The roof is still in good condition and has no need for replacement or repair. The aluminum asphalt paint (silver coating) has preserved the roof all these years. Notice all the A/C units and debris left by workers. With all this foot traffic and carelessness from workers, the roof withstood all that abuse. This is a Torch Down Rubber Roof that was left unprotected for over 12 years. Notice the wrinkling and unevenness of the membrane. The owners did so little they even let the drain clog up and plants started to grow. A roof is a very expensive part of a structure. 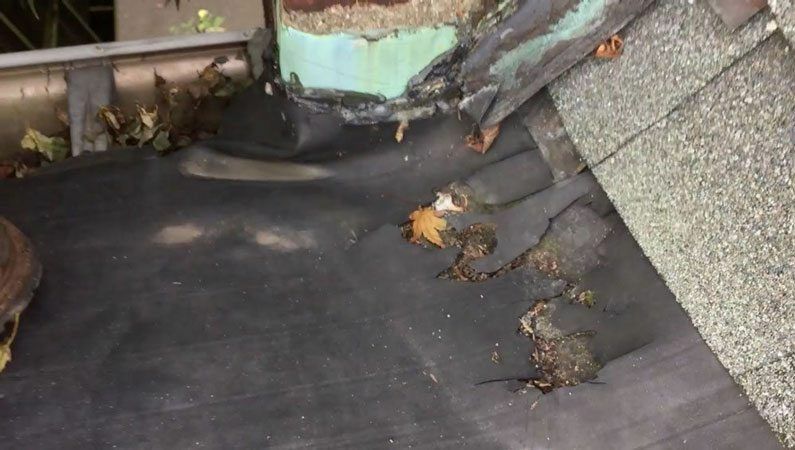 If not treated properly, will cause damage to the substructure and eventually not only a roof replacement, but repairs that could have been avoided. A Torch Down Rubber roof that is not protected against ultraviolet will easily last 15 years if correctly installed. This image shows ouch a roof in Norwalk Connecticut. The only problem they had with the roof was the drains or scuppers. The scupper outlets were too high and water could not drain properly off from the roof. In this case, this roof could still be preserved by coating it with an aluminum asphalt paint. As long as the membrane doesn’t have spider cracks and is not wrinkling, then a protective coat can extend the life expectancy. Here is another example of an unprotected torch down rubber roof. In this case, was it not only not protected from ultraviolet rays, but the rubber membrane wasn’t installed correctly. Notice the wrinkles and curling. That happens when a fiber base paper is not installed. This roofing contractor was not knowledgeable about the installation of a Torch Down Rubber Roof and the owner paid a dear price. This happens when someone trusts anyone that calls himself a roofer.